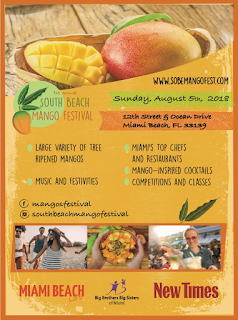 Miami Beach, FL – Introducing the first ever of its kind, South Beach Mango Festival, being unveiled on Sunday, August 5, 2018, from 11 a.m. – 7 p.m. at South Beach’s beautiful, white sandy beach in Lummus Park, adjacent to Ocean Drive. With the mango craze hitting an all-time high, ranging from mango shampoo to mango beer, South Florida wants to commemorate and celebrate the importance and peak of its famed fruit. The event is aimed at tropical fruit lovers and culinary enthusiasts, as well as the domestic and international visitors who flock to South Beach. The event will also benefit a vital non-profit philanthropic organization, Big Brothers and Big Sisters. With South Florida beginning an upwards shift towards introducing healthy festivals and expos into the mix, millennials, families, locals and visitors will have the opportunity to continue to educate themselves on healthy eating options and alternatives, using mango in their recipes, with activities including a farmer’s market offering more than 40 varieties of juicy, sweet, locally farmed mangoes; mango tastings; cooking classes for kids and adults, featuring the golden fruit; a children’s play area; and an entertainment area with live music and dancing; top chef demos, and a memorable mango-mixology competition. A sampling of creative farm-to-table culinary creations, showcasing the luscious mango from a variety of South Florida’s top fine-dining destinations and neighborhood cafes, served amid cooling ocean breezes, will make this a not-to-be-missed, uniquely South Florida experience. The festival was born from the passion of visionary entrepreneur Robert Lansburgh, the Chief Mango Officer and mango enthusiast, with direction and host, Culinary Director, Chef Allen Susser. Chef Allen is one of the original members of “The Mango Gang,” the group of supremely talented chefs who injected South Florida with the tropically-infused cuisine in the 1990s. The gang launched local cuisine into the national and international culinary repertoire, attracting new visitors and shining the media spotlight on South Florida as an exciting dining destination. Recipient of the prestigious James Beard Award as best chef in the Southeast; a famed restaurateur, restaurant consultant, mango aficionado, and educator, Chef Allen is the author of a highly regarded book on mangoes, “The Great Mango Book”. 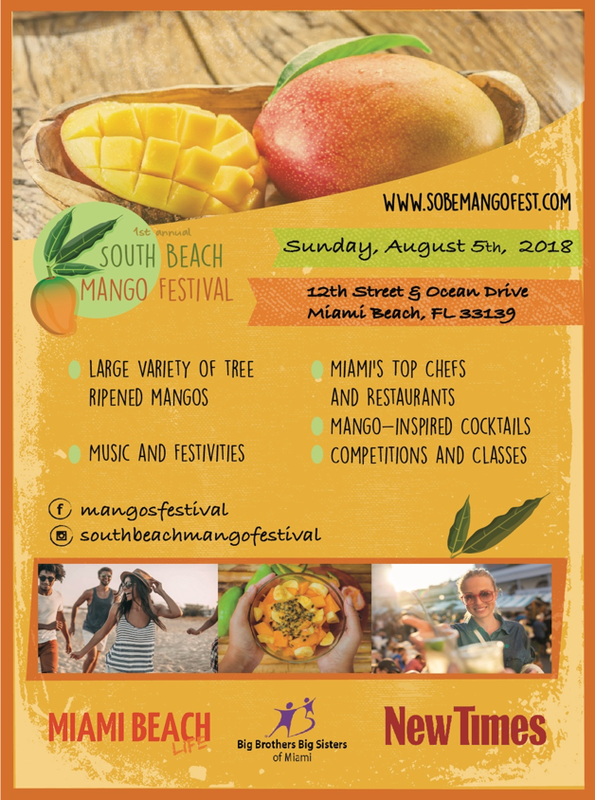 Being that this is the first ever fruit festival to take over South Beach, there will be no shortage of tropical fruit to go around at the various mango competitions, top restaurants, stations for artists, vendors, and sponsors, with a plethora of tastings and recipes. Feast on the delicious array of MANGO infused specialties direct from fine dining establishments of Miami, while discovering new eats and libations by huge sponsors including Miami New Times, Miami Beach Life magazine, and Big Brothers, Big Sisters of Miami. Ticket prices: $20 for adults, $12 for Miami Beach residents, and kids 7 under are free. VIP tickets $59. As a taste of what's to come, please visit the website www.sobemangofest.com and visit the Facebook page: https://www.facebook.com/mangosfestival. Robert Lansburgh was born and raised in Miami Beach, and grew up with a mango tree in his backyard. As part of his upbringing, he would spend time at friends’ houses, and one always knew when it was mango season, because everyone had mangoes in their kitchens. His Aunt Merle kept his affection of mangoes satiated, gathering mangoes from friends in Coconut Grove and bringing them on visits. Mangoes have become exceedingly important to Robert, as the flavor has really made an impression on his wife, friends, and kids. Five years ago, a search on Craigslist yielded a kind man with 15 trees in Miramar. Since then, they have met once a week during mango season for an exchange. The average delivery is over 100 mangoes. Armed with mangoes and with the ability to only consume 7 or 8 per day, Robert and his family have mangoes to share. While eating a Miami mango in his kitchen, his “aha” moment came when he said to his wife, “there should be a mango festival here in Miami Beach”. Minutes later, after a coincidental conversation with a Miami Beach Commissioner, the epiphany was shared. After making a few calls, it was decided that Chef Allen Susser would join the team. Allen and Robert have known each other for over 30 years. When Robert was 12 years old, Allen was the head Chef at the Monaco Dining Room at Turnberry Isle. Years later, Allen opened his famed restaurant, Chef Allen’s and is a James Beard Award recipient and an icon in global cuisine circles. Allen and Robert brought on Big Brother and Big Sisters of Miami, of which Robert is a Big, and his Aunt Merle was a social worker there for over 40 years.